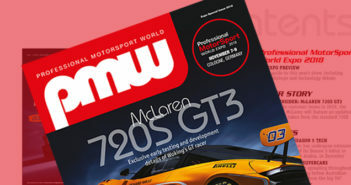 In the March-June 2017 ‘Green’ Issue of Professional MotorSport World magazine we featured the, as then in development, eRally project. 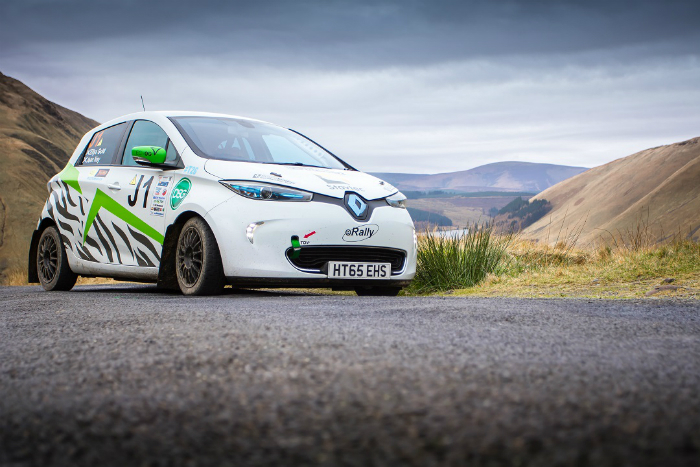 Since then, the rally-prepared Renault Zoe EV has gone on to complete its first competitive event. 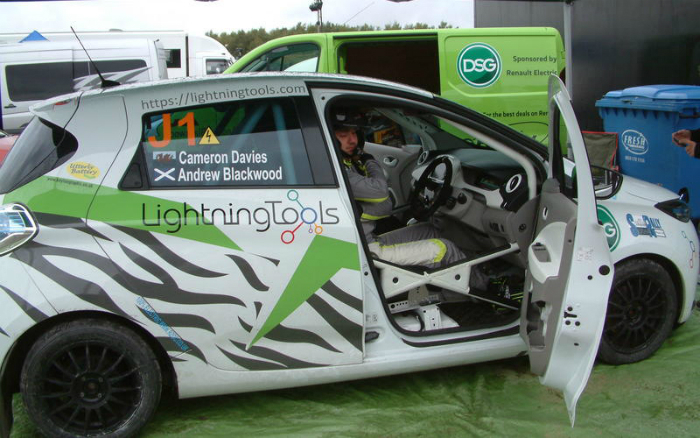 At the wheel was former Professional MotorSport World Expo ‘Young Rally Driver of the Year’ winner, Cameron Davies. We caught up with the 23 year-old, to find out what the transition to electric motorsport was like. For those that don’t know, could you bring us up to speed on your career to date? 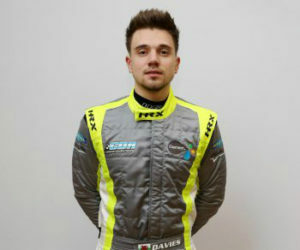 “I started when I was 14, doing the F1000 junior championship, which was a championship for 14-17-year-olds. I used a Nissan Micra that year which me and my father built in the garage. I used to save up money from Christmas and things like that to try and get the car together. The first round I ever did, I finished second, which was a surprise for as the guy who won was just about to turn 17, he was quite a bit older. When I was younger, I used to be quite a chubby kid, I used to do nothing to do with fitness, so when I finished second I thought that I needed to do something about that before the second round. So rather than eating a Mars bar before the event, I tried to eat a bit healthier, drink water instead of Coke, things like that. I was basically trying to take things a bit more seriously, and I actually won my second event. From then on, I think I won every single round that year, so I was British Junior Rally champion that year, and I was Britain’s youngest rally champion. How did the decision to drive the eRally come about? I had a call one day from the eRally boss, Ellya Gold, telling me about the project. I’d heard about it before and seen him on various events where he was promoting it. He asked me if I’d like to drive it on its debut. I was quite excited to be honest. I’d been watching Formula E and seeing how that has been developing, I’d been doing quite a bit of work with BMW on various launch events with the i3 and some of their electric stuff. I see how everything is going, and I’m excited to get involved with it. It’s the future at some point along the line. Did you look for advice from other drivers? It is a different type of driving, and that was one of my worries – that’s the only thing I was apprehensive about. 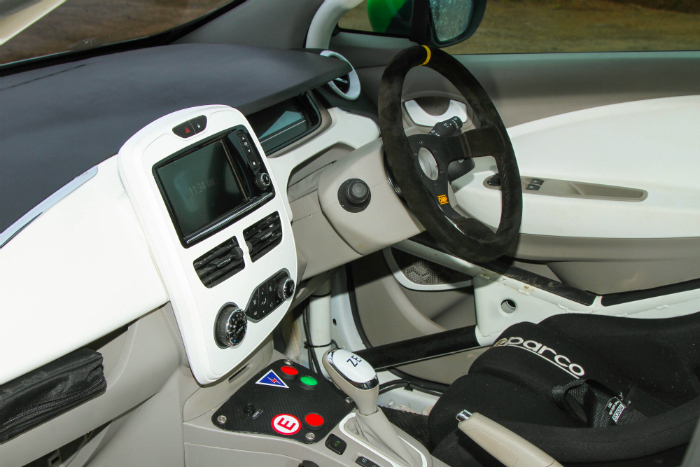 The driving of the car is completely different to a vehicle with an engine and gearbox, where you’re using the gears to help you. The Zoe has just one long gear, and it has so much torque and it takes you right the way up. I spoke to a lot of people who are involved with electric cars to see how I could get the most out of it. What sort of things were they telling you? 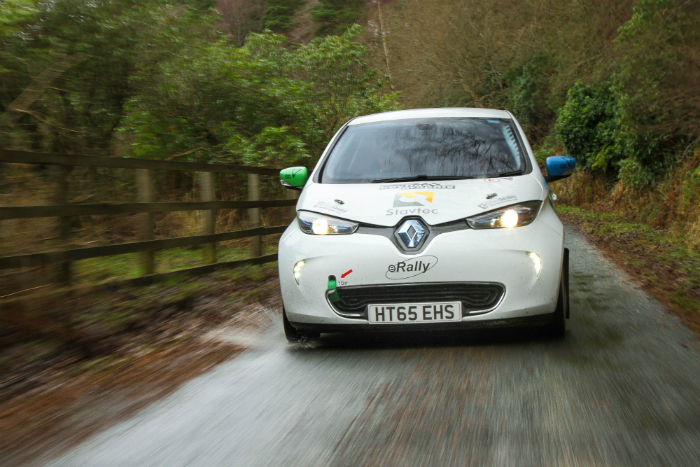 The biggest thing was the regeneration on the Zoe, and driving with that in mind. Driving a normal rally car, as soon as you come off the power, it keeps rolling and you’ve got to press on the brakes as hard as you can. With the regen it was having to drive smarter, so you’re waiting for that to actually help you brake a bit more, so you’re on the brakes less. 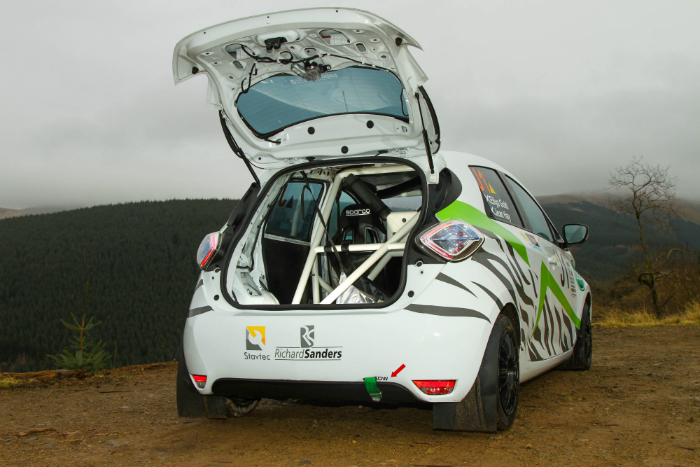 It’s really about thinking ahead more – which is good for a rally driver, as you always want to look ahead anyway, but the regen makes you that little bit sharper. How did the eRally’s debut go from your perspective? We turned up on the Saturday, and the event was on the Sunday. There was about 60 cars started, and on the second stage we managed to set 26th fastest out of all of them, to our surprise to be honest. 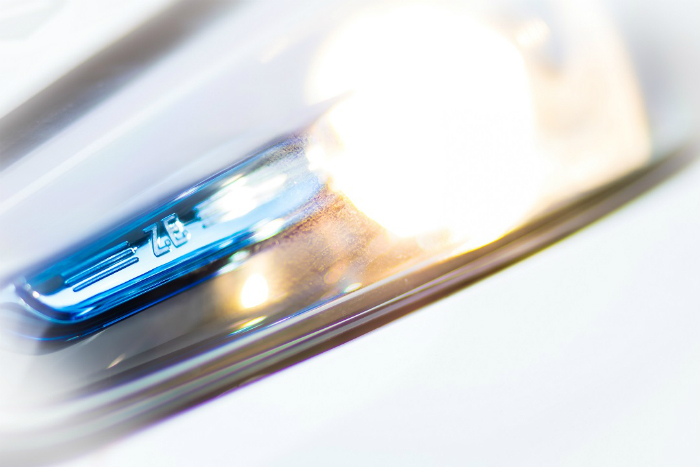 We were a little worried about the car making the event on a charge – we had a normal slow charger in service, off the mains, so we were plugging in during services. But obviously, because of the type of event, and the fact that you’re on the power all the time, it’s hard to get a lot of regen off the car because you want to be off the brakes as much as you can and not slowing down. So rally drivers also suffer from range anxiety? When you’re queuing up at the start line, that worry does go through your mind. But once you start getting going, you forget about all these things and you’re focused on getting the best time possible. 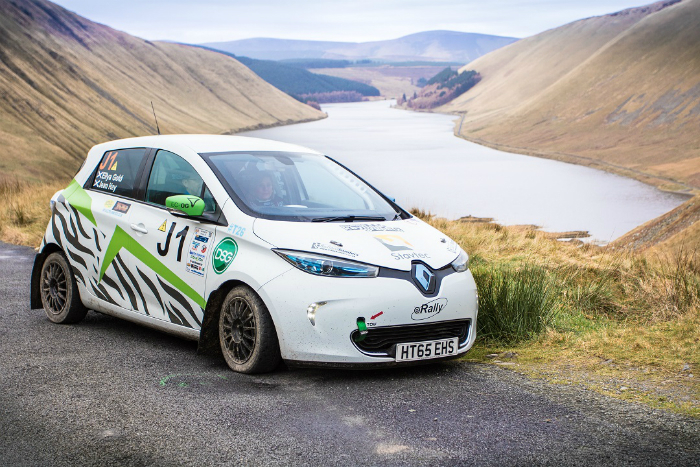 I was assured by the team, who had done their calculations – though they were a little bit worried, but thankfully didn’t tell me about that until the end of the rally – and they were convincing me that it was all going to be fine and the Zoe would make it. We actually crossed the finish line with two miles of range left. The dashboard was lit up like a Christmas tree… It was judged perfectly. So whenever the car isn’t being used, it’s plugged in on a slow charge? Yes. Compared to normal rallies, where you pull in and the mechanics jack the car up and check the engine bay, in this case the first thing we were doing was plugging the car in and checking everything else after. So faster charging would be an obvious improvement for the future? Because this was the first, there aren’t those kinds of facilities available. That’s one of the things that will undoubtedly be part of the journey, developing all these bits that go with rallying electric. I’m not sure how close they are to doing it, but I’ve heard they’re working on a trailer to transport a fast-charge unit. Was there anything about racing the vehicle that surprised you? Largely it was as I expected – as I mentioned, I’d asked a lot of questions from a lot of people to learn as much about it as I could. I was more surprised by the handling of the Zoe – with the batteries and therefore the center of gravity being so low. Another thing that I didn’t expect was that, though I knew it had torque all the way from the bottom, but it was dealing with that through the corners. Usually you’d rev the car up through the corners so you have the torque coming through, but it was a surprise just how instant it was midway through a corner. How did you actually do over the event? I think overall we came about 36th. To be honest, my main aim was to finish the rally, and having the range to complete it. It was hard to know where it would sit because it was the first event. In comparison it’s only a junior-type vehicle, and only really comparable to a 1-liter road car – so we didn’t expect to win or anything like that, but I suppose we didn’t expect to do as well as we did either. When we set 26th fastest, there were a few raised eyebrows across the event, and we definitely created a bit of interest. Lots of people came to look at the Zoe. Did everything go smoothly with the car? It ran really smoothly. There’s always some hiccups, especially being the first, but it ran like clockwork. With the Zoe being an electric car, the mechanics were over the moon because there was nothing to really look at. You haven’t got the engine and gearbox to look at, there’s no oil to check, there’s only really the brakes. There’s things to check on a road car, but servicing was bliss. The car ran faultlessly. We plugged in, checked the wheel nuts, that was it. It was almost worryingly smooth because you expect something to break! What’s next for the Zoe project? We’re waiting to see what we can do. The plan is to grow it further, and get more cars so that we can have more of an event between the electric cars. There’s talk of putting me into another event, maybe at Anglesey, but no definite plans yet. 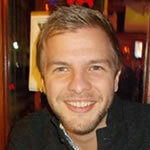 You must be excited to get involved with the project at such an early stage? That’s one of the main exciting things about it. It’s going to be the future at some point. Maybe rallying will continue how it is for the next few years, but it’s exciting to say that I’ve been there at the start, working with manufacturers, seeing what works and what doesn’t. It’s a great learning process for me as well. I find every part of this project interesting.